28 April probably means nothing special to you. 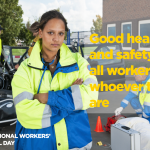 It was the date in 1914 when Canada passed an Act to compensate workplace injuries, chosen in 2003 by the International Labour Organisation to celebrate Workers’ Memorial Day – an international day for health and safety at work. A date that has left a more indelible mark in labour’s memory might have been more fitting. On 10 March 1906, a pit disaster in Courrières, northern France, left an official death toll of 1 099. A fire outbreak had been detected on 7 March, and the miners had reported the gas firedamp. The mine owners did not stop the work because that would mean losing money. Workers from neighbouring pits organized their own relief operations while the government sent in 26 000 troops to crush the protests that erupted in the region in the wake of the tragedy. On 25 March 1911, a fire at the “Triangle Waist Company” garment factory in Manhattan, central New York, killed 123 women and 23 men workers because the owners had locked the doors. The bosses were prosecuted, but acquitted. On 6 July 1988, 167 workers perished on the Piper Alpha drilling rig off the Scottish coast. These were the Thatcher years, which saw trade union rights under systematic attack and the factory inspectorate undermined. On 10 May 1993, 188 workers (mostly women) died in a fire at the Kader Toy Factory where toys were made for the big industry multinationals. On 24 April 2013 – not even a year ago – more than 1 100 men and women workers died in Bangladesh, exploited in the worst conditions by big name European and US clothing brands. Thinking about it, it’s better to have a date that is nothing special in the calendar. 28 April does not conjure up something we think of as a one-off accident. It’s another day in our daily lives. Death by work is an ongoing reality determined by the pursuit of profit, flexibility, a lack of democracy in the workplace. The EU’s Agency for Safety and Health at Work estimates there are at least 400-500 workplace deaths in the European Union each day. More than 160 000 deaths a year. What most workers suffer is illness more than death: persistent backache and joint pain, depression, having to stop work before retirement age. The net/net is that health is no better distributed than wealth, housing or education. Those who have wealth live longer and in much better health than those who produce it. Deregulation policies are deepening these inequalities. Stock exchange share prices are reported daily over the airwaves like war communiqués reflecting the ideology of competitiveness. But no word of the price paid by workers to enable shareholders to rake in their profits. 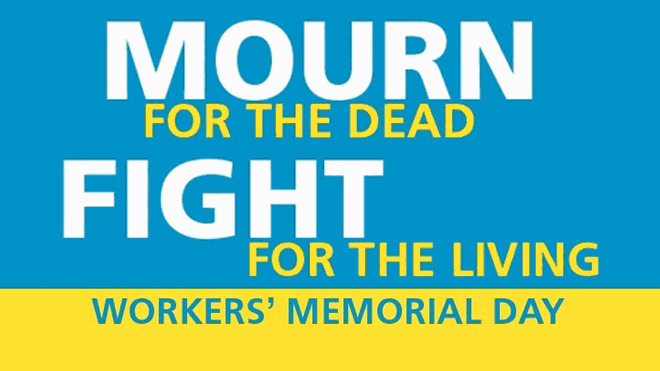 On 28 April, national and European institutions will wax emotional with solemn pledges to improve working conditions. The other 364 days of the year, they will not be walking the talk. EU health and safety at work policy has been at a virtual ten-year standstill under the two Commissions headed by President Barroso. New legislation has been snarled up in reams of red tape, having to clear impact study hurdles which show that workers’ lives and health are a profitable commodity, that they are not a “burden” on employers. So let us not be taken in by the false sentiment on 28 April, but demand a clear and detailed accounting. Why has revision of the Occupational Cancers Directive been blocked for a decade? Why has the Musculoskeletal Disorders Directive never appeared? 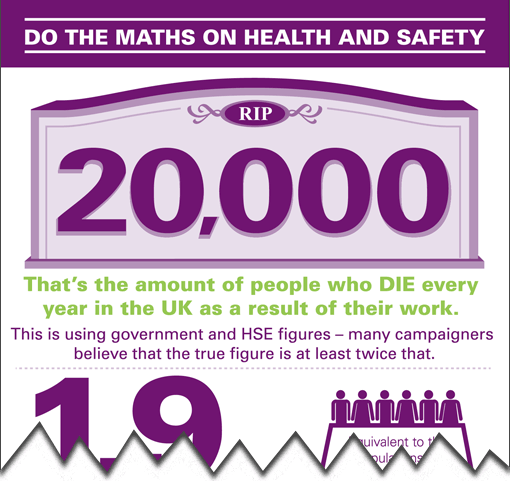 Why are health and safety inspectorates so woefully under-resourced in most EU countries? Why do fewer than one in two workers in Europe enjoy the minimum democracy of appointing a health and safety representative? We know from experience that without this balancing scrutiny over business decisions, prevention is illusory. “Pray for the dead, and fight like hell for the living”. Your article is very useful and provocative. It is a good reference material for info dissemination to all workers worldwide. Health and safety issues could not be compromise at the expense of poor workers.